TAKE CLIMATE ACTION! STOP PERTH’S DAM FROM FILLING! Climate alarmist Kevin Rudd says “the [NSW} drought is influenced by climate change” and the Prime Minister must “lead global climate action” to stop it. Meanwhile, Perth’s dam is at record highs. Does Rudd want “climate action” to stop that, too? BUT, for members of the devout Climate Crisis Industry, like The Guardian’s George Monbiot et al., record cold is caused by “global warming”! The utterly corrupt body of climate science has been getting ever more desperate to scare people about climate change and thereby submit to their radical anti capitalist agenda. People are not falling for it, so we are now being subjected to ever more absurd announcements like this. The whole premise of this latest is so wholly ridiculous that, if it had been in any other field of science it would have instantly dismissed as juvenile fantasy rambings with no evidence at all. This is the latest puerile attempt to fool the public. I am on holiday, but it took me about ten minutes to spot the gaping fallacies in their argument. The world has been much warmer than now, even in the recent past, yet we have never had this supposed runaway warming. 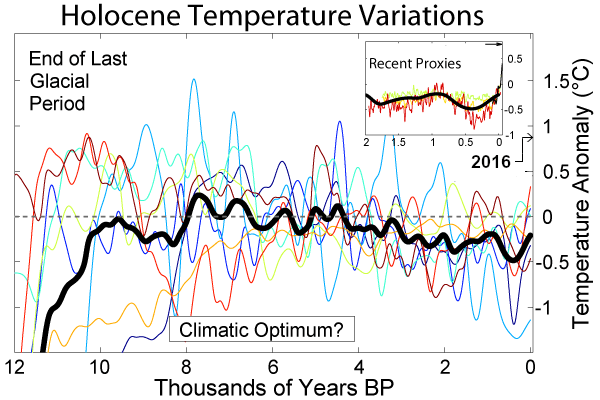 In particular, temperatures in the Arctic have been much higher throughout just about all of the holocene. We know from ice cores that temperatures in Greenland in the 19thC were the lowest since the ice age. Yet these con artists expect us to believe that current temperatures are leading us into oblivion. Using the same logic, the same plunge into the LIA should also have led to runaway cooling. The simple fact is that the world has a remarkable stable climate, which reacts to natural climatic changes, but does not run out of control. 2) The Study relies heavily on warming in the Arctic, which supposedly will lead to ice loss, methane release etc, which will in turn cause further warming. But we know that Arctic temperatures were much higher a few thousand years ago. We also know they were just as high in the 1930s and 40s. There was no runaway warming then, and won’t be now. 3) The study also invokes the prospect of the Amazon rainforest dying off because of global warming, and the Sahel returning to desert. It is said that these events will add to CO2 in the atmosphere. Yet we know from historical evidence during the early holocene that a warmer world is a wetter, greener one. That is why the Sahara was verdant 5000 years ago. Proper climate scientists, such as H Lamb knew a long while ago that cold global climates lead to droughts, not warm ones. The public has shown itself remarkably resilient in its determination not to have its standard of living damaged by left wing climate policies. Hence the increasingly desperate attempts by the climate mafia to blame every hurricane, flood, heatwave and drought and wildfire on fossil fuels. And when that does not work, why not try hell and damnation as well? Now, isn’t that a surprise?